When you walk into Woodburn Hall on the IU campus, you may notice a mural near the front of the room. On this mural, you see a large image of white nurse caring for a black baby. Farther down on the mural, you will see a journalist, which is historically significant because it was journalists who exposed the corruption that led to the downfall of the Ku Klux Klan, which once ruled Indiana politics. The artist who painted the mural, Thomas Hart Benton, is known as an opponent of the KKK. But this is not quite the image you have been told about, is it? If you were to believe the ranting of shameless race-baiting demogouges, you would think the Woodburn mural is a celebration of a white supremacist hate group. Nothing could be further from the truth. A December 16 letter to the editor in the Herald-Times suggests "the painting so prominently displaying the KKK could be taken out of Woodburn. The artist could have put KKK members in handcuffs, but instead, chose them marching in full regalia." This incredibly dishonest misrepresentation of the mural is nothing short of reprehensible. The Woodburn mural (again, painted by an opponent of the Klan) is a representation of Indiana history, and like it or not the KKK is a prominent part of Indiana history. We should never seek to sweep history under the rug because it is ugly or repulsive. Remembering the worst parts of our history (and the Klan's influence over Indiana certainly qualifies) serves as a reminder not to repeat the sins of the past. This is one of the reasons that Holocaust "revisionists" (deniers) are held in such low regard. The murder of several million Jews (and others) by Nazi Germany is a tragedy that we must never forget, and the phrase "never again" is often used when remembering it. The December 16 letter argues that "reminders of lynching are not something students of color want hitting them in the face during class." I am sure an image of the KKK is uncomfortable to look at, but there is plenty of information available to put the mural into context. Students offended by the mural can easily educate themselves about the mural and its place in Indiana history. Those who are not able to sit in a lecture hall with the mural and unwilling to educate themselves about it may want to consider if they are mature enough to pursue higher education at this time and drop out until they grow up. 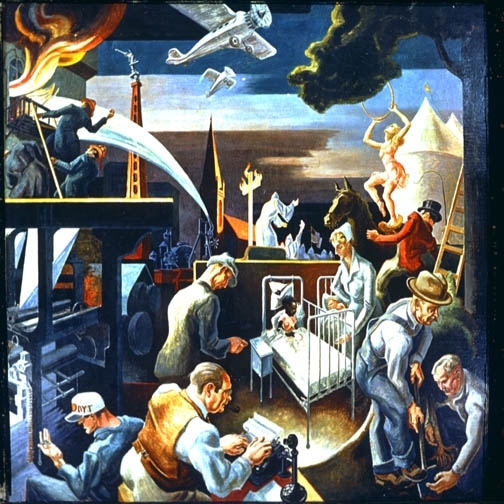 Indiana University has posted a history of the mural on the university's Web site. When Colonel Richard Lieber of the Indiana Department of Conservation (who had to approve the mural) resisted including an image the KKK, Benton got Democrats in the Legislature involved. Democratic "legislators apparently demonstrated such an enthusiasm for revealing the sins of their political opponents that Lieber caved in and agreed to permit Benton to include the Klan in the mural," according to the IUB web site. The repeated calls to remove the Benton mural from Woodburn Hall represent a dangerous attack on freedom of speech and academic freedom. No institution of higher learning should ever practice censorship to soothe hurt feelings, especially when those feelings are not in line with established historical fact, ignore the context of the mural and ignore the positive images on the mural. And, as I said at the beginning of this column, we should not cast aside images of racial harmony and the memory of those who fought the KKK in favor of uninformed hurt "feelings" or worse, shameless race-baiting demagoguery.